SKOPJE -- When I mentioned to friends in Italy and the UK that I was coming to work in Macedonia, most had only the dimmest idea of the country, or even that it exists as an independent state. In fact, the former Yugoslav republic gained its independence from Belgrade in 1991 without a shot being fired. Exactly a decade later however, civil war loomed after an armed uprising by mainly indigenous ethnic Albanian insurgents. It ended after six months, with a peaceful NATO-policed disarming of the rebels, but ethnic flare-ups are still not uncommon. Not that you’d know it, sipping Turkish coffee, say, in Skopje’s Old Bazaar. This part of the capital is the centre of Muslim life in the city, and a remnant of the Ottoman period, which for Macedonia only ended in 1913. I met Marina Arsovska here, in the Turkish Nargile café. It’s in the courtyard of a lovely 15th century building, the upper floor of which is occupied nowadays by a Muslim girls’ school. Well-mannered pupils walked along the balcony between classrooms in their bright-blue uniform head-scarves, and the sound of them reciting their lessons drifted down to us in the café. In North-West Europe multiculturalism is a recent phenomenon, and to some a discredited one, but here it is a fact of life that goes back centuries. (The Italian word for fruit salad, macedonia, and the French assorted-vegetable macédoine, allude to the racial mix of the area). However, there is an elite, mainly made up of the ethnic Macedonians, who are mainly Slavic and Orthodox Christian, and make up about two thirds of the population. Marina is one of them and she saw the school’s use of this important building as a privilege granted to the ethnic Albanians. However, she didn’t resent it, or any of the government’s wide-ranging concessions introduced as part of the Ohrid peace agreement after the 2001 insurgency. We went to her family house in one of the most sought-after suburbs of Skopje, on the lower slopes of the impressive Mount Vodno. "Here there are no ethnic Albanians," she said. "But I had many friends among them at university in Tetovo." Half the students there were Macedonian Albanian, she said, reflecting that city’s make-up. I remembered that I’d read a vivid, first-hand description of the Battle of Tetovo in John Phillips’ book ‘Macedonia: Warlords & Rebels in the Balkans.’ It was the biggest engagement of the 2001 insurgency, but it was only when I brought the subject up again that Marina told me her family was directly affected. "It was my grandparents’ city and they had to leave during the fighting." I was struck by her matter-of-fact attitude – but then this 28 year-old could be said to have seen it all. Her father was also involved in the Battle of Tetovo, as a helicopter pilot in the Macedonian army who attended the scene when another aircraft "crashed." Two men he knew well were killed. Mr Arsovska joined the then-Yugoslav army at 21, and was serving as a pilot while successive republics broke away from the country and Belgrade used force to try and prevent their secession. Marina remembers the family being forced to flee the Bosnian city of Mostar in the middle of the night amid intense bombardment. Fortunately for her, perhaps, she was too young to understand what was happening, but later she learnt that her father was tortured at one point. I met him later that day, mild-mannered and now retired, he is not keen to talk about his experiences. However, like most Macedonians, he is very friendly, and proud of this beautiful country. It’s mostly mountainous, with over 50 peaks at 2,500 metres or more. The skiing is good, there are some lovely lakes, and a number of striking hill-top monasteries. Tourism though is in its infancy, which of course appeals hugely to many. Patrick Syder specialises in small tours to out-of-way locations. "Macedonia is one of the least touristy parts of Europe – you really feel as if you’re breaking new ground. Plus there’s a fascinating mix of cultures, and it’s very picturesque. 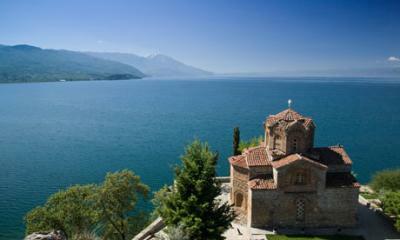 Ohrid is stunning," he says, referring to the lake that is the jewel in Macedonia’s crown. It’s a holy centre for all Orthodox Christians, with literally hundreds of places of worship, from tiny shrines to breath-taking thirteenth century churches, including the monastery where St Cyril and Methodus, the patron saints of all Slavs, invented the Cyrillic alphabet used in Church Slavonic. The town of Ohrid is listed by UNESCO for its ecclesiastic significance, and the lake on which it sits for its unspoilt beauty, unique ecosystem and extreme age. Most lakes have a life span of under 100,000 years before they silt up, but that process is much slower in Lake Ohrid, due to the great clarity of the springs which feed it. Mile Nikolovski, a local entrepreneur, hopes to gain from the slow but steady increase in tourism, and is soon to launch a spa, Debar Springs, in the mountains 100 miles (130 km) from Skopje. The visit to the site was my first trip out of the capital, and I quickly saw an eagle, but was even more excited about witnessing my first ever wild tortoise. Mile was blasé, however. "These are common, but we also have wolves, bears and, most rare of all, lynxes." Avni, one of the Macedonian Albanian workmen I’d been talking to earlier, chipped in. "Yes, they have strict laws to protect them now – just like us Albanians!" Mile, an ethnic Macedonian, seemed genuinely amused, laughing uproariously.